What are Ultra short-term debt funds? Demonetisation has brought forth the idle cash held by Indian households, resulting in a lot of inflow into the mainstream financial (banking) system - Rs 14.971lakh crore until December 10, 2016 according to RBI. While a portion of this money is expected to be withdrawn over the medium-to-long term by investors, some of this money would remain in the financial system, and this is where the opportunity for investors lies. Rather than looking at traditional investment avenues, such as savings bank accounts and bank fixed deposits (FDs),investors can look at debt mutual funds for investment options. In this article, we will look at how Ultra short-term debt funds can help Investors park a portion of their idle money for an investment horizon of 6 months to one year. These are money-market funds that invest in certificates of deposits (CDs), treasury bills, commercial paper (CPs) and corporate bonds, with an average maturity ranging 6 months to one year in most cases. Further, redemptions in these funds are processed within few days . Interest income taxed as per the income-tax bracket. ^ Surcharge at 15% to be levied in case of individual/ HUF unit holders where their income exceeds Rs 1 crore. Note – The comparison of Ultra short-term funds and Banks FDs are given for general information purpose only. Ultra short-term debt funds, represented by the CRISIL–AMFI Ultra Short FundPerformance Index, have given an absolute return of around 9%. Source: CRISIL Research, Data until January 31, 2017. While these funds are market–linked, our analysis of CRISIL-ranked ultra short-term debt funds in December 2016 shows that these funds have maintained superior credit quality over the past one year (see chart 1). Further, true to their mandates, these funds have invested around 48% on average in short-maturity instruments, such as CDs and CPs during the period. 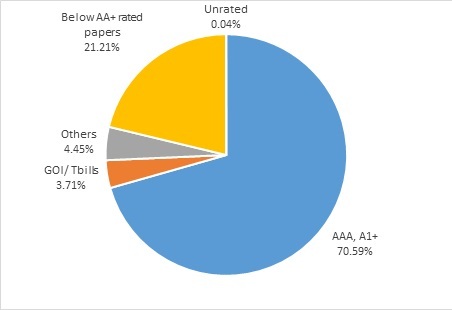 On credit quality, these funds have 79% exposure to top-rated (AAA/A1+) paper, government securities and cash equivalents. Note that these funds, unlike traditional investments, do not provide any assurance of a fixed return and are subject to risks, such as credit risk, interest-rate risk, mark-to-market and market risks. Investors can allocate a portion of their portfolio to these funds and capitalise on tax efficiency, liquidity and the ability to get a reasonable return. The investor should also assess a fund's portfolio, investment objectives and risk profile before investing.